It’s time to think big about public transport. We need a high-quality public transport solution that will transform the city. As things stand, Dublin is beginning to gridlock, commute times are increasing, and quality of life is decreasing. We should take note from cities like Copenhagen and Berlin, where metro systems have been successfully implemented, commute times are shorter, and road congestion is relieved. This page will be updated with current news regarding this important project. 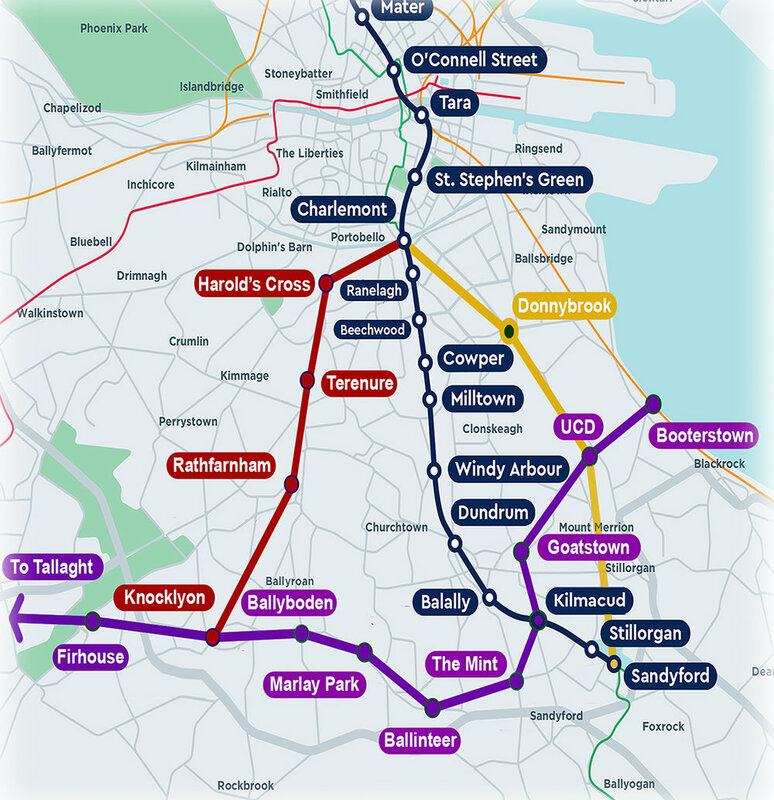 Following the announcement made by the NTA that the Metro South would stop at Charlemont asked the Taoiseach if this decision was final and if he would yet consider proposals relating to alternative routes to UCD or Rathfarnham. You can watch the full exchange below. I recently had the opportunity to ask the Taoiseach for his views on alternative routes for the MetroLink project and urged him not to delay the Northside section or cancel the Southside section. You can see that below. Green Councillor Francis Noel Duffy’s motion, passed by South Dublin County Council, called for the route of the Metrolink project to go from Charlemont to Knocklyon via Harolds Cross, Terenure and Rathfarnham. Following this I raised the motion and proposals with Minister Shane Ross. You can watch that below. I recently had the opportunity to ask the Taoiseach about the Metrolink. I have been campaigning for two possible alternative routes - one through Harold’s Cross to Rathfarnham and beyond, and another connecting UCD. You can see my exchange with the Taoiseach and a map of what some alternative routes might look like below. Last week, I held a public meeting in the Evergreen Club in Terenure to discuss the Metro link and to consider its proposed expansion to Rathfarnham. On that same day, I wrote to Minister Ross calling for a review of the MetroLink design in it's current state and hope that he will consider my proposal which I've submitted to the NTA as an alternative. As well as relieving the ever increasing traffic congestion in this corridor we want to make it more safe for cyclists and improve ease of access to the city centre. You can watch the full presentation I gave on the night here. We are continuing to liaise with the various residency groups and hope to hear from you about any ideas or concerns that you might have on the proposal. We urgently need to address the gridlock and traffic chaos beginning to return in Dublin. In my submission to the National Transport Authority on the Metrolink Consultation last month, I proposed significant changes to the Metro link project which would improve the whole project and spread the gains to other areas. One of these changes would be to extend the Metro tunnel to Rathfarnham. We should continue the tunneling machine south from Charlemont street to link with three new stations in Rathmines, Terenure and Rathfarnham. This transport corridor is one of the worst public transport blackspots in our city with no other easy solutions in sight. Taking this option would also remove the need to fully segregate the Luas Green Line, where there is real concern about restrictions to local access around existing stations. Join me and my colleagues in the Evergreen Hall, Terenure on Wednesday the 27th of June at 19:30 for an informative meeting to discuss this proposal. Places are limited so make sure to register for your free tickets on our eventbrite page. You can read further about the proposal in my recent article in the Irish times here too.